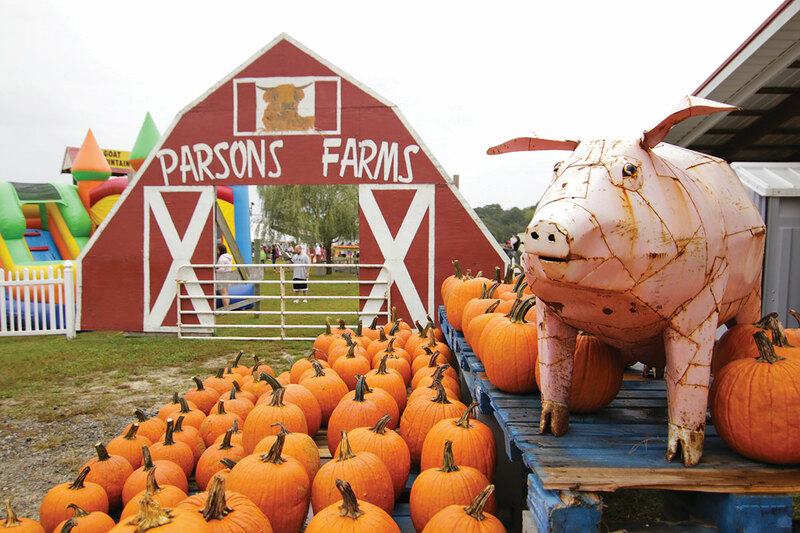 The Parsons Farms Fall Festival is an annual celebration of all things autumn. The Selbyville Halloween Parade brings floats, costumes and fun to town each year. It’s fall — and there’s a lot more to the season than “pumpkin spice everything.” From craft fairs to costume contests, from barbecue competitions to bike shows, there are just about as many events as there are leaves falling. • Movie Night at Magee Farms — Magee Farms will host a showing of the movie “Hocus Pocus” on Friday, Oct. 13, at 7 p.m. at its Selbyville location. Candy and drinks will be available for purchase; moviegoers should bring their own blankets or chairs to sit on. Magee Farms is located at 34857 Lighthouse Road, Selbyville. • Fall Jumble Sale — On Saturday, Oct. 14, the Ocean View Presbyterian Church’s Women’s Circle will host their Fall Jumble Sale from 9 a.m. until noon, featuring plants, fine jewelry, books, homemade baked goods and “white elephant” items. All proceeds will help the OVPC Women’s Circle to continue supporting various missions in Sussex County, including the Tunnel Cancer Center, the Pyle Center, Ten Mile Miracle and the Cheer Center Meals on Wheels Program. Ocean View Presbyterian Church is located at 67 Central Avenue in Ocean View. For more information on the Fall Jumble Sale, contact Liz Hobler at (302) 541-0487. • Parsons Farms Fall Festival — Parsons Farms hosts its annual fall festival on Oct. 14 and 15 from 10 a.m. to 4 p.m. Some of this year’s events will include a pie-eating contest, bobbing for apples contest, hayrides, a petting zoo, corn pit, dress-a-goat competition, bounce houses and more. Admission to the festival costs $7; children 2 or younger are admitted free of charge. • Bethel UMC Fall Fest — The Bethel Mission Team will sponsor a Fall Fest on Oct. 14 from 8 a.m. to 1 p.m. at Bethel United Methodist Church, 129 W. Fourth Street, Lewes. The Fall Fest will feature a flea market, craft fair, food, fall stories and songs, face painting, knuckle pumpkins, root painting, pin the nose on the pumpkin, bird feeders, leaf printing, pumpkin tower/beanbag toss, ring toss, duck pool, petting zoo, sack races, limbo, parachute games, Chuckles the Clown, youth band, hotdogs, chips, soda, Two Dips ice cream truck and a fire truck to climb on. All proceeds benefit the Immanuel Shelter. Admission costs $4 per child or $10 per family. For more information, call (302) 645-9423, email ofice@bethellewes.org or visit www.bethellewes.org. • Truck R Treat costume party — The Dagsboro Volunteer Fire Department will host its 10th Annual Truck R Treat costume party on Oct. 15 at 1 p.m., rain or shine. Children will get free treats, hotdogs and refreshments. The costume contest is for children from infants to age 12, with prizes to be awarded in Most Original, Scariest, Cutest, Group and Family Group. Children must be registered by 2 p.m., and judging will take place at 2:30 p.m.
• Breast Cancer Awareness Car/Bike Show — The Delaware Breast Cancer Coalition’s Fifth Annual Georgetown Breast Cancer Awareness Car & Motorcycle Show will take place on Saturday, Oct. 21, from 9 a.m. to 3 p.m. at 16 Mile Brewery in Georgetown. The event is free to attend, with car owners paying $12 per car to enter the show. The family-friendly event will include a D.J., door prizes, goodie bags, live auction with Dave Wilson, craft fair vendors, swap meet, food vendors, meet-and-greet with NASCAR driver Harry Gant and an evening concert with Glass Onion. For more information, contact Levin Clark at (302) 500-1128. • Salem U.M. Fall Festival — Salem United Methodist Church will host a Fall Festival on Oct. 21 from 8 a.m. to 2 p.m., featuring crafters, jewelry, a yard sale, Christmas items, gently-used clothing and a tent tag sale. Lunch and assorted baked goods will be sold. People may donate sale items by Oct. 16. Proceeds benefit Salem’s Women of Faith and local mission projects. Salem Church is located at 29 West Church St., Selbyville. • Craft fair, bake sale, soup sale — The Lakeside Community Home Owners Association will host a Craft Fair, Bake & Soup Sale from 8 a.m. to 2 p.m. on Oct. 21 at Pot Nets Lakeside Community Center, 33076 Rock Cove, Long Neck, featuring 32 crafters of painted items, jelly and jam, mesh wreaths, jewelry, sea glass art, soaps, fused-glass items, quilted items, sea glass jewelry, laser-cut wooden art, lighted bottles, American Doll clothes, candles, hand-crafted greeting cards, watercolor paintings, hand-painted slate, bird feeders, handmade purses, wooden coastal art and more, along with vendors for Scentsy Fragrance and Tastefully Simple. Baked goods of all kinds will be available for sale, as well as pints and quarts of soup to take home, and lunch and dessert offerings. • Friendship UMC Fall Festival/Trunk or Treat — Friendship United Methodist Church in Millsboro will host a Fall Festival on Saturday, Oct. 21, from 2 to 6 p.m. The festival, which is free and open to the public, will feature a moonbounce, hayrides, games, food, prizes and music. The church is located at 30983 Friendship Road, Millsboro. Starting at 6 p.m., the church will host a Trunk or Treat. • Boo-Que — The third annual Boo-Que family barbecue festival will return to Delaware Seashore State Park on Oct. 21 and Oct. 22 at the Indian River South Inlet Day Area, including Halloween-themed activities, a 5K race, live music, wing competition, beer garden and a professional barbecue competition sanctioned by the Kansas City Barbecue Society, along with amateur and children’s competitions. The event is open Friday from 4 to 9 p.m. and Saturday from 11 a.m. to evening. The cost of admission is $5 per person and free for children younger than 12 with an accompanying adult. Park entrance fees are in effect. Details are at www.boo-que.com. • Halloween Appreciation Day — The Roxana Volunteer Fire Co. will host its 2nd Annual Roxana Volunteer Fire Co. Halloween Appreciation Day on Sunday, Oct. 22, from 1 to 4 p.m. The fire company holds the event as a way to show its appreciation to the members of the community for their support. A costume contest will be held, with a $25 Visa gift card for the winners in each age group and a $50 Visa gift card for the overall winner. Age groups for the contest are newborn to 2, 3 to 6, 7 to 11, and 12 and older. The fire house is located 35943 Zion Church Road, Frankford. Other activities include a DNREC K9 demonstration with Cpl. Josh Hudson and K9 Officer Rosco, firehouse demonstration, Emergency Operation Center demonstration on how to call 911, petting zoo courtesy of Parsons Farm, TAKE 10 CPR demonstration, 18-foot inflatable slide, fire truck rides (weather permitting), GEM Recruitment, Archery Wars (child-friendly; courtesy of Anchors Aweigh Entertainment), children’s games with candy and other prizes. There will be free hotdogs, chips and popcorn for each guest. The judging schedule is: newborn to 2, 2-2:20 p.m.; 3 to 6, 2:20-2:40 p.m.; 7 to 11, 2:40-3 p.m.; 12 and older, 3-3:20 p.m. Each age group will need to line up five minutes prior to their judging time. Winners will be announced at 3:45 p.m.
• Selbyville Halloween Parade — The Selbyville Halloween Parade will be held Wednesday, Oct. 25, at 7 p.m. The parade will march along Church Street, from town hall to Main Street, featuring three local high school bands, parade floats and children dressed in their costumes. The Fenwick Island Lions Club will sponsor the event and will sell hotdogs, hamburgers, and hot and cold drinks near the viewing stand, and people can purchase tickets for the 50/50 drawing (the winner need not be present). The children’s costume contest will take place before the parade, at the Salem U.M. Church parking lot. Handicapped parking is next to the Georgia House restaurant. For more information and participant applications, call (302) 436-8314 or (301) 655-0742. • Movie Night at Magee Farms — Magee Farms will host a showing of the movie “It’s the Great Pumpkin, Charlie Brown” at its Selbyville location at 7 p.m. on Friday, Oct. 27. Candy and drinks will be available for purchase; moviegoers should bring their own blankets or chairs to sit on. Magee Farms is located at 34857 Lighthouse Road, Selbyville. • Magee Farms Fall Festival — Magee Farms will hold its annual Fall Festival on Saturday, Oct. 28, from 11 a.m. to 4 p.m. at its Selbyville location. Magee Farms is located at 34857 Lighthouse Road, Selbyville. • Frankford Fall Festival — The Town of Frankford and Envision Frankford, with assistance from local churches, the Frankford Volunteer Fire Co. and the Frankford Public Library, will host the town’s annual Fall Festival on Saturday, Oct. 28. A full day of activities is planned, including a costume contest, parade, and more at the park. Registration for the costume contest is in the fire company parking lot, 5 Main Street, and begins at 10:30 a.m. Judging will follow at 11 a.m. Winners will be announced at 12:30 p.m. in the town park. For age groups 2-and-younger and 3-to-4-year-olds, prizes will be awarded for Funniest, Most Original, Best Prince/Princess and Best Cartoon. Prizes for the Scariest, Funniest, Most Original and Most Realistic will be awarded for age groups 5-6, 7-9 and 10-12. The parade will begin at the town hall at 11:30 a.m. and will end at the town park. Fun continues in the town park from noon 4 p.m., with games, haywagon rides, food and more. 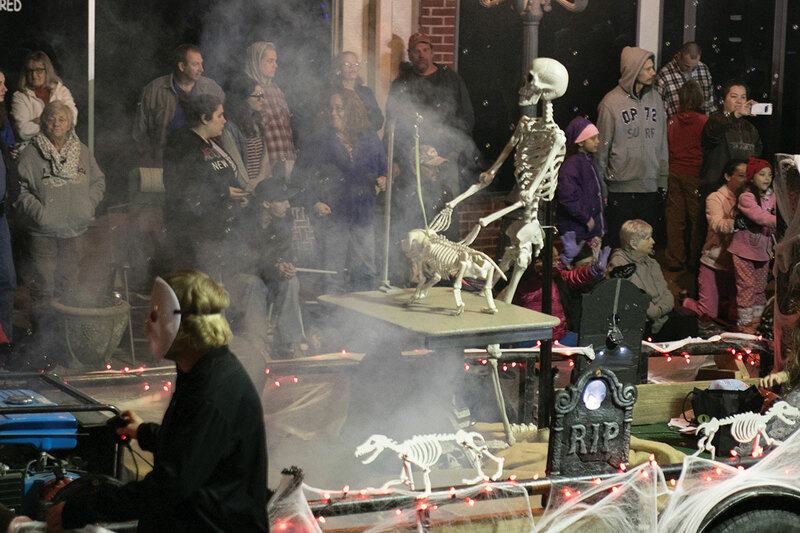 • Wags, Witches & Warlocks — The annual Wags, Witches & Warlocks Festival & Parade will be held on Saturday, Oct. 28, in downtown Bethany Beach. The event brings families and pets to town for a day of fun while raising money and awareness for Partners for Paws of Delaware. The parade, featuring an appearance by the Indian River High School Marching Band and costume contest, will get under way at 10 a.m. Participants can then enjoy activities such as Halloween crafts for kids and bobbing for tennis balls for the pups. Kids can also safely trick-or-treat at the town businesses from 11 a.m. until 1 p.m. For more information, go to www.WagsWitchesandWarlocks.com.